Calgary, Alberta--(Newsfile Corp. - July 12, 2018) - Teras Resources Inc. (TSXV: TRA) ("Teras" or the "Company") announces the Merger/Acquisition with NV Mines of Nevada which was announced on April 24th, 2018 has been completed. Teras is now positioned, with its new management team and technical expertise, to take its projects to a new level focusing on its Cahuilla project. Peter Leger, President and CEO of Teras remarked, "The acquisition is a big move forward. As well, we would like to formally welcome Mr. Steven Craig to the Teras management team. Mr. Craig has an excellent reputation in the minerals industry, being well respected throughout the mining community in bringing exceptionally high quality projects forward. Our new team will focus on advancing Cahuilla to an entirely new level in a very timely manner. We now have the full-time expertise to evaluate, acquire, model and develop projects from exploration to mine production and negotiate high profile transactions." Mr. Steven D. Craig has over 44 years' experience as an Economic Geologist specializing in mineral exploration and development of all types of metal deposits. He has held several executive level positions in exploration, development, and mining companies including Kennecott Exploration/Rio Tinto, Romarco, Gryphon Gold, Golden Phoenix Minerals and El Tigre Silver. He has worked in the United States and several foreign countries including Mexico, Honduras, Peru, Brazil and Papua New Guinea. Most of Mr. Craig's work has been in the Western United States and Nevada, where he has either directed or been a participant in numerous gold deposit discoveries and mine expansions. He has gained extensive experience in mine permitting, compliance, NI 43-101 resource modeling and related technical report requirements. Mr. Craig has occupied leadership positions ranging from mid- to executive management within various companies. He is a CPG and holds a M.S. in Economic Geology. Steven Craig remarked, "It is with great professional pleasure for me to be joining Teras Resources and its management team. 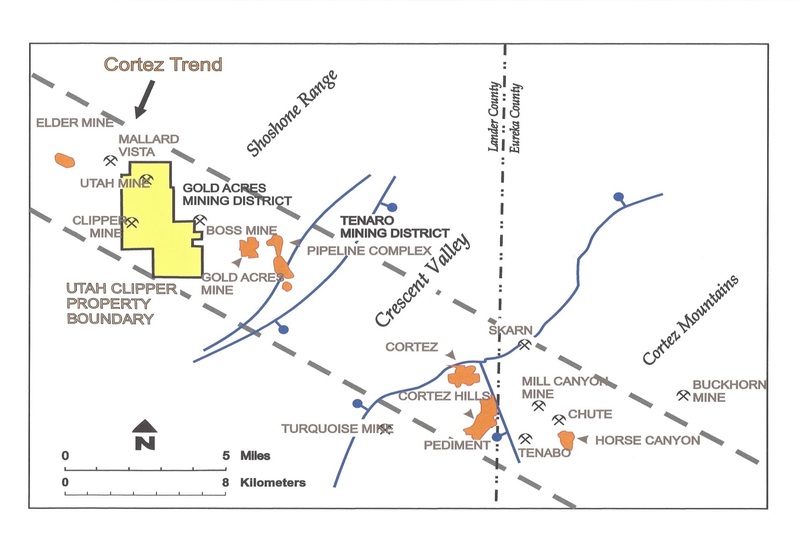 Teras' flagship property, the Cahuilla gold-silver project, is quite familiar to me as I directed one of the first drill programs on the deposit with Kennecott in the 1990's. Teras has made significant advances at Cahuilla since Kennecott held the project and I am confident that together, we can bring tremendous value to the Company's shareholders in the near future. The vast majority of my professional career has focused on exploring and developing precious metal deposits in the western United States and this experience will greatly assist in further advancing the project and giving Cahuilla the exposure it deserves." Teras will issue 3,565,000 shares of its common stock to the shareholders of the Nevada company shareholders (referred to "NVM") in exchange for 100% the shares of NVM. Teras will own 100% of NVM which controls a high-profile project in Nevada known as the Clipper Mine. Teras is pleased to inform its shareholders that the TSX Venture Exchange has consented to the extension in the expiry date of the following warrants: Private Placement: # of Warrants: 13,483,750; Original Expiry Date of Warrants: July 4, 2018; New Expiry Date of Warrants: July 4, 2019; Exercise Price of Warrants: $0.15 (Unchanged). These warrants were issued pursuant to a private placement of 13,483,750 shares with 13,483,750 share purchase warrants attached, which was accepted for filing by the Exchange effective July 6, 2017. The TSX Venture has also consented to the extension in the expiry date of the follow warrants: Private Placement: # of Warrants: 9,454,332; Original Expiry Date of Warrants: July 22, 2018; New Expiry Date of Warrants: July 22, 2019; Exercise Price of Warrants: $0.24 (Unchanged). These warrants were issued pursuant to a private placement of 9,454,332 shares with 9,454,332 share purchase warrants attached, which was accepted for filing by the Exchange effective July 26, 2016. Teras is focused on developing its Cahuilla project located in Imperial County, California. The project encompasses an area of at least 3 km by 1.5 km and Teras believes that the Cahuilla project has the potential to develop into a mining operation consisting of altered and mineralized sedimentary host rocks with numerous high-grade sheeted quartz veins. Teras filed a NI 43-101 technical report with an indicated resource of 1.0 million ounces of gold and 11.9 million ounces of silver on its Cahuilla project (70 million tons at an average grade of 0.015 ounces per ton gold and 0.17 ounces per ton silver with a cut-off of 0.008 ounces per ton gold) and inferred resource of 10 million tons grading 0.011 opt gold and 0.10 opt silver. Gold equivalent ounces are 1.2 million ounces in indicated class and 130,000 ounces in inferred class using a ratio of 55 ounces silver to 1 ounce of gold. This press release contains "forward-looking information" within the meaning of applicable Canadian securities legislation. All statements, other than statements of historical fact, included herein may be forward-looking information. Generally, forward-looking information may be identified by the use of forward-looking terminology such as "plans", " expects" or "does not expect", "proposed", "is expected", "budgets", "scheduled", "estimates", "forecasts", "intends", "anticipates" or "does not anticipate", or "believes", or variations of such words and phrases, or by the use of words or phrases which state that certain actions, events or results may, could, would, or might occur or be achieved. In particular, this press release contains forward-looking information regarding: the Cahuilla project, and its newly acquired Clipper project. The development and advancement of the Cahuilla project and the Clipper project, the development of geologic models in respect of the Cahuilla and Clipper projects, the development of further drill plans and the potential of the Cahuilla project or the Clipper project to develop into a mining operation. This forward-looking information reflects the Company's current beliefs and is based on information currently available to the Company and on assumptions the Company believes are reasonable. These assumptions include, but are not limited to, the actual results of exploration projects being equivalent to or better than estimated results in technical reports or prior exploration results, future costs and expenses being based on historical costs and expenses, adjusted for inflation, the ability of the Company to obtain acceptable financing, market acceptance of its exploration programs and projects; consistent and favorable commodity prices; and regulatory acceptance of the Company's geologic models . Forward-looking information is subject to known and unknown risks, uncertainties and other factors that may cause the actual results, level of activity, performance or achievements of the Company to be materially different from those expressed or implied by such forward-looking information. Such risks and other factors may include, but are not limited to: the early stage development of the Company and its projects; general business, economic, competitive, political and social uncertainties; commodity prices; the actual results of current exploration and development or operational activities; competition; changes in project parameters as plans continue to be refined; accidents and other risks inherent in the mining industry; lack of insurance; delay or failure to receive board or regulatory approvals; changes in legislation, including environmental legislation, affecting the Company; timing and availability of external financing on acceptable terms; conclusions of economic evaluations; and lack of qualified, skilled labour or loss of key individuals. Although the Company has attempted to identify important factors that could cause actual results to differ materially from those contained in forward-looking information, there may be other factors that cause results not to be as anticipated, estimated or intended. Accordingly, readers should not place undue reliance on forward-looking information. The Company does not undertake to update any forward-looking information, except in accordance with applicable securities laws.Neither the TSX Venture Exchange nor its Regulation Services Provider (as that term is defined in the policies of the TSX Venture Exchange) accepts responsibility for the adequacy of accuracy of this news release.